Eric Driggs has volunteered at the Omaha Public Library's Genealogy Department since 2005. For Eric Driggs and his wife, genealogical research became a hobby from the moment they first watched “Roots” on television in 1977. The show piqued the couple’s curiosity about their own familial roots and started their pursuit of genealogical history, which has lasted 41 years. 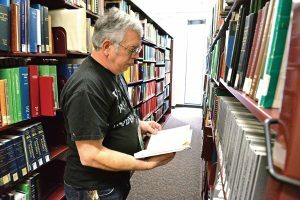 Though the internet has changed the way people conduct their genealogical research, Driggs began his at the place in which he has volunteered since 2005—OPL’s Genealogy Room, located at W. Dale Clark Main Library. Libraries, books and public records are still some of the best sources for historical information; and with years of experience sleuthing through historical documents, archives and databases, Driggs has become a valuable asset to those who visit OPL in their own pursuit of historical knowledge. “The greatest thing about Eric is that he will sit down with a patron for an extended period of time and help them figure out what they need and how to look for it,” said Martha Grenzeback, OPL genealogy & local history librarian. Having retired from International Paper in April 2017, Driggs now volunteers at OPL twice a week, in addition to the volunteering he does at the Corrigan Senior Center and the Harrison County Genealogy Society in Woodbine, Iowa. Even when he isn’t volunteering, Grenzeback said that Driggs always has the library on his mind. He keeps an eye open for items to donate to OPL’s collection or anywhere the historic materials he finds might be relevant. With his experience in genealogical research and desire to turn others on to the wonder of uncovering their family’s history, Driggs plays an important role at OPL. If you find yourself in need of assistance with your own genealogical research projects, stop by Main Library on Friday or Saturday before 1 p.m. and he will be happy to help guide you! If you or someone you know is interested in volunteering at OPL, visit your neighborhood branch or omahalibrary.org/volunteer for information.